Warning: this is not a definitive statement of current UK law – you are responsible for making a check yourself. Guess who got pulled over by the police on the way back from our Club Xmas party today! And why.... for having brake lights which didn't work! My Seven is an RM short wheelbase saloon, first registered in July 1931, which does not have brake lights fitted! Further to the Police stopping this member's car because "..the rear brake lights were not working". If fitted, then of course the brake lights should work. The italics then imply as the car was first registered in 1931, Rear Brake Lights are not required. Presumably the correct hand signals were used to indicate the driver was slowing down etc. The definitive reference for ‘legal’ lighting requirements is in ‘Statutory Instrument 1989 No. 1796’ (The Road Vehicles Lighting Regulations 1989). OBLIGATORY LAMPS, REFLECTORS, REAR MARKINGS AND DEVICES, Table 1, Stop Lamp (Schedule 12: Part 1) EXCEPTIONS, …. 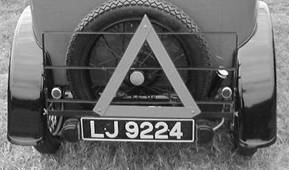 A vehicle first used before 1st January 1936. Schedule 12: Part 1, identifies the Stop Lamp(s) requirements for 1st January 1936 onwards, which can be one or more stop lamps. So, yes our member is correct in stating they are not required, but I feel not having stop lights is a little fool hardy, much the same as inadequate indicators, which unfortunately is where I fall down ( I have working trafficators, but…), although I do use hand signals most of the time. Flashing indicators are being made ready for fitting this year. Further to my letter in respect of Stop lamps. Unfortunately the photos are b/w. There was an excellent 6 page article in the A7CA’s ‘Grey Book’ 1988B, by Phil Baildon on ‘The Law and the Austin 7’ which gave all the requirements for cars to pass their MOT, including minimum lighting requirements. May I emphasise this article is for your guidance and must not be relied on in a court of law. All the following is based on an average interpretation by different police forces. The dry facts from ‘The Road Vehicles Lighting Regulations 1989’ Schedule 10 are:- In all cases, if fitted, they should work. Side-lamps. Two, white, shall form a pair. Can be separate or combined with headlamps. No minimum diameter, specified wattage (3 or 6 watt) or angles but "visible to front from a reasonable distance". Maximum distance from side 20”, no minimum height or rearward limit. Headlamps. Two, white or Yellow, matched pair (except pre 1931). No min. diameter or specified wattage except 30w main beam 1931 on, when both must dip and be diffused or frosted glass. Pre 1931 plain glass OK. Height between 2’ and 3’6". Direction Indicators. No requirement before 1936, but if fitted must comply and work. Note flashing conversions incorporated in sidelights /tail lights to 31/8/1965, or separate amber flashers also comply, with dash or column tell tale. Two, Red, Matched pair. No specific wattage, size or angles – must be visible for a reasonable distance. There is no minimum height for fixing lights. One or two, no specific size or wattage, "..to adequately illuminate the plate". Thus the early tourer or Ruby can remain as a Plate light or the plates illuminated by the two side windows of REAR POSITION LAMPS. None, non-standard cars having an off-side rear plate, need not be duplicated on the near side, but Stop and Tail Lamps must be. 1 1/2" diameter. They must be at (approximately) the same height and inwards distance. No requirement before 1936, may be a single central converted, before 1971, or two combined with the rear position lamps. (b) A rear position lamp shall not be fitted on a boot lid or other movable part of the vehicle. I’m not sure how this affects luggage racks, but the normal rear lights would hardly be visible if they were not on the rack, and certainly not to a lorry driver close behind. 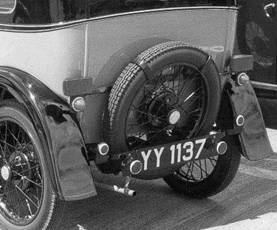 No reflectors and only a single rear light, with a number plate window, were fitted to Austin 7’s up to at least 1938. Therefore to comply with the current requirements both a pair of reflectors and a second rear lamp must be fitted and both lamps must be matched and of equal distance from the centre line of the car. So whilst fitting the second lamp, on the assumption its not another tiny Lucas AT201 (see photo JT 651 – not very clear, but the outer lights are indicators), why not have a stop light as well. The lamps, style 'D' (ST 51 - see photo LJ 9224 and Pork Pie (ST 38A – see photo ECV 924) already incorporate a stop light, these two types are the ones usually fitted to upgrade lighting requirements. Photo BHK 107 seems to show no reflectors, although it did have an MOT certificate according to the sales particulars! Although we normally fit the rear lamps on either side of the number plate, I think there is a case for fitting them further apart, at night the closeness of the lights implies the car is further away, in fact the further apart we can place the lights, e.g. on rear wings, the better (photo JSJ 299 also retaining the original AT 201 as a number plate lamp) – no, mine are either side of the number plate. If we do not have stop lamps or indicators then according to the ‘Highway Code’ (HC) we should be using hand signals, although I understand the latest HC does not list these. The HC is only a guide to good road practise, but it was cited as part of a police prosecution case in February this year, when a driver did not give a clear indication of their ‘intention’ to turn left at the next junction. Somewhere I have an old HC showing the whip positions used by carters, what would ‘white van man’ think of these? Modern drivers really do not understand the limitations (or otherwise) of our little cars, and every opportunity we have to advise them of our intentions, by a method they quickly understand, is to the advantage of our own safety. One of our latest members, Dave Mann (CN 5212), living in the ‘North’, has had many a rear close shave, so after a particularly near ‘white van’ encounter he fitted a clip on tail board, which both raises the height of the lighting and is highly visible to other road users (think of how many modern cars now have rear window brake lights to make sure the day dreamer behind knows what’s happening). Dave takes the board off at Rallies etc, thus presenting the car in an early condition. See photo’s of CN 5212 and also YY 1137 which is not Dave’s car. In the late 70’s, when working in Transport Management, I was seconded to the Transport and Road Research Laboratory (TRRL) at Camberley, and a part of my work was concerned with the causes of motorway rear shunts, from this research and experience, my views are derived. This article, written by Sandy Croall, originally appeared in CA7C Seven Focus in Mar 2005 pp16-19.